This happened a bit faster than I realized. Karen has opened the registration for Discover New Features in Painter X3 at the Digital Art Academy. Karen listed the class as Open Enrollment, but I’m asking that it be changed to regular enrollment. That means you will need to register by the end of the first week of classes, or by Aug 2. Either way works. Regular enrollment means we all start at the same time. Open enrollment allows folks to enter at any time. The class begins on July 27th. 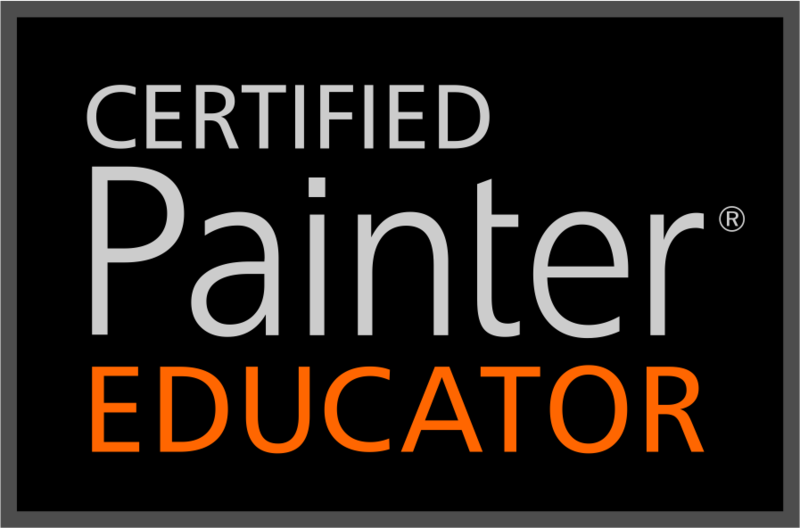 You can download a free trial version of Painter X3 at the beginning of the class. That way you will be able to discover what is new in X3 and then decide if you want to buy it. I am sure you will want it. UPDATE: Sorry, but I forgot to take video 5 off private. I have set it correctly now and it is available for viewing. I can’t help it; I’m a dunce. LOL. I follow Painter Factory, a forum for Painter users provided by Corel Painter. It is a great forum; you can ask questions or answer them; you can even suggest enhancements and new functions for future versions of Corel Painter. I notice a thread that someone who is new to Painter asked if an art pen would be proper for a newbie. All the answers were terrific. But, it gave me the idea to follow my post about setting up the Intuos 5 with posts about the Wacom Art Pen and how you can tame it in Painter 12. It is a fabulous tool, and I would highly recommend it to traditional artists. I have created 6 videos, each around 5 minutes long. This first video shows the enhanced brush ghost as the best cursor to use with Art Pen, and I explain the advantages of barrel rotation. In this video, part 2, I take a look at a variant that doesn’t have any rotation function and try to change it to a variant that does have rotation ability, however, I found that Expression Rotation in the Angle Brush Control Panel doesn’t always work…why? In this video, part 3, I find what dab types will work with rotation and which ones will not. In this video, part 4, I discover the RealBristle brush control panel; I will explore it next. In the fifth video we explore the RealBristle brush control panel. It has lots of sliders all geared to help you make the perfect variant based on traditional values. In the last video, I review what I have learned. I also talk about sample multiple colors and how the realbristle brushes can use sample multiple colors…very cool. Well, there you have it. My take on the Wacom Art Pen. I love mine and when not demonstrating, I use it exclusively. I hope you will give it a try. I love Corel Painter and I love my Wacom Intuos 5 Touch. I have been rather busy of late, and since we have had several new Wacom Tablet Drivers, I messed up and lost my preferences. I hadn’t set them up completely anyway, and I had always planned to do a series of videos about how my settings, so now seemed the perfect opportunity to do a series of videos showing the how and why of my settings. I tried to keep each video under 5 minutes, but failed miserably. I don’t think I had one over 8 minutes though. Please note, I am using a Wacom Intuos 5 Touch. If you are using an Intuos 4 or an Intuos 5 without Touch, I think the videos will still hold interest. The first video is a quick introduction to Wacom Tablet Properties. The second video talks about programing the Grip and Art Pens. The third and fourth videos concern touch. The fifth video is about Express Keys. Since we can only program functions that have shortcut commands, I needed to create shortcut commands for several functions. This video explains making shortcut keys. The sixth video is also about Express Keys. I demonstrate how to make the Express Keys work only in Painter. Video 8 explains the Radial Menu. And the last video…number 9…wraps it up with saving the preferences. OK, that’s it for this post. I do need to apologize for never finishing the painting using Painter Lite. I got sidetracked and simply lost interest in the painting. Then, everyday, I put pressure on myself to finish it. It was awful. I may or may not finish the painting. Right now I want to do some other stuff in Painter. For those of you who enjoy hearing about Kevin from time to time, I have to report I haven’t seen him in a while. I don’t know where he is; I assume he is still living in my computer. I recently moved a whole bunch of stuff to an external hard drive; I hope he didn’t get lost in the move. Anyway, as soon as I can find him, I’ll give you a report on what he has been up to.